Double sinks can be very handy and this unit has just that. Alongside lies a large cupboard which is big enough to house a freestanding dishwasher/fridge/freezer. 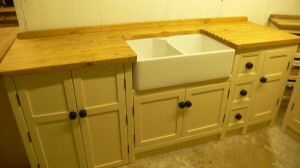 This ‘double’ sink unit with dishwasher cupboard has been painted in a lovely classical combination of ‘ringwold ground’with contrasting ebonised handles.The 27mm pine worktop has been stained in our antique pine colour then handwaxed with a waterproof wax making it durable,this will come with a chrome lever tap.